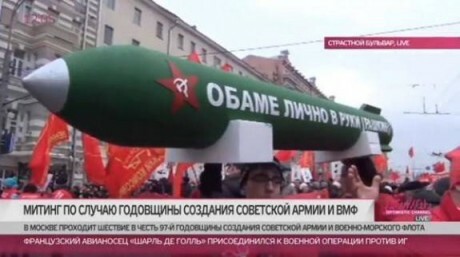 "During one recent military parade, a large missile was paraded through the streets with a message to Barack Obama written on the side. Roughly translated, the message says “to be personally delivered to Obama”…"
The Russian military and the U.S. military are going in two very different directions. Military spending in Russia is increasing by a whopping 33 percent this year alone, and the Russians are feverishly preparing as if a major war with the United States is inevitable. But despite the fact that the conflict in Ukraine has raised tensions with Russia to Cold War levels, the Obama administration is still acting as if we were living in a “post-Cold War” era. 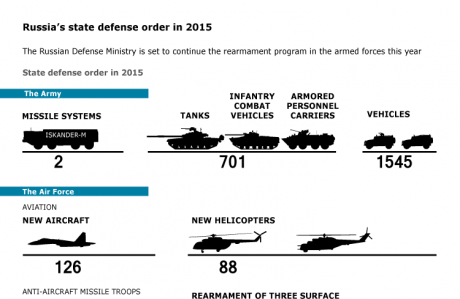 Even while the Russians are arming themselves to the teeth, the U.S. military is being gutted. In fact, the U.S. Army is in the process of being cut down to the smallest size that we have seen since the end of World War II, and the U.S. Navy is already the smallest that it has been since World War I. There is very little political debate about this gutting of our military at the moment, but someday we may look back and bitterly regret not being more prepared.